What if you could donate to charity, and get your money back in full? It seems like there would be a catch, but that’s exactly what Causora is doing. 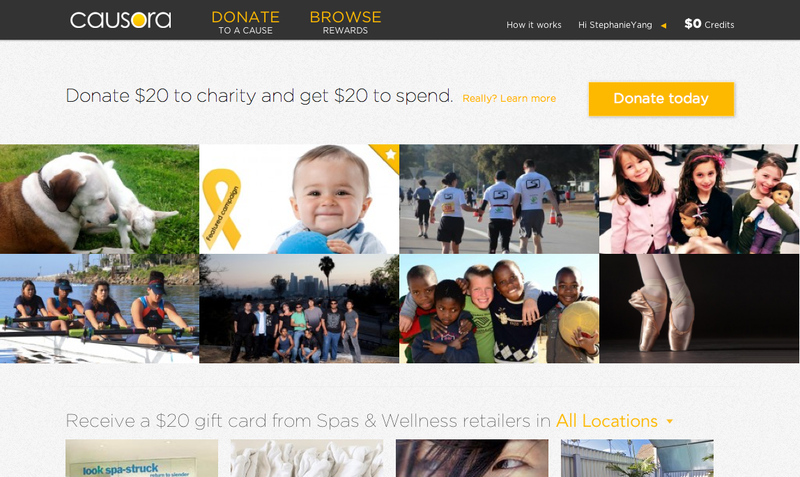 The startup, which launched its platform a month ago, allows users to donate to nonprofit organizations and receive matching rewards in gift cards. Here’s how it works: After registering on Causora, users can donate to more than 150 nonprofit organizations on the website. If you can’t find the charity you’re looking for, you can add it yourself, and it will appear on the site after it goes through Causora’s verification process. When you donate, your account receives the same amount as your donation in Causora credits, which can be redeemed for vouchers in $20 increments to any of Causora’s 150 partner merchants. The credit-card company takes a little less than 3 percent of your donation, and Causora takes 7 percent to generate revenue and keep up operations. So in total, about 90 percent of your contribution goes to the charity chosen on the site, and you still get your money back in choice of services. Partnering merchants receive business through gift cards and publicity, so it’s a win for everybody. If you just want to donate to an organization without any rewards, 97 percent of your donation goes straight to the nonprofit. By bringing incentives to a larger audience, founder Kai Buehler hopes to increase donations to nonprofit organizations that are struggling to grow their donations year over year. However, a study by The Chronicle of Philanthropy shows that charitable donations increased 14 percent in 2012 through online processors such as PayPal. Regardless, if Causora is looking to increase philanthropic awareness on a wide scale, rewards and online donations are the way to go. There are downsides to Causora, but nothing that can’t be fixed. Right now, all choices are local and related to health and wellness. That means the merchant page is populated mostly with spas in California. Another downside to this is you can only use one $20 voucher at a time. So if I wanted to donate $100, I would basically have five different certificates, each of which would have to be used at a separate time or location. That’s five more trips to the spa or salon that I would normally make, plus I have to fill in the difference. The good news, Buehler tells me, is Causora is adding food and restaurants as the next options for rewards. Causora also plans to expand to different states toward the end of the year. Even though you’re basically getting your money right back, the process of looking through the donation and reward options, donating and redeeming could be too much of a hassle for those who just want to give to a cause. To lower the barrier of donating even further, Causora is working on embedding a widget onto the websites of nonprofits, as well as their pages on Facebook. That way, users can make a donation directly from the cause’s site. Buehler has started and sold three other businesses. Watchpoints, his most recent startup, sold in 2011 for $3 million. In January, Causora raised $100,000 from angel investors including executives from Google and Univision. Causora, which launched its first crowdfunding campaign today to raise $2,500 in 60 days, is still working on building out its merchant base and accessibility. But if you were planning on going to a spa in Los Angeles, Orange County or the Bay Area, now you can take a couple of seconds and donate to charity in the process.